John F. Tinker and Mary Beth Tinker, minors, by their father and next friend, Leonard Tinker and Christopher Eckhardt, minor, by his father and next friend, William Eckhardt v. The Des Moines Independent Community School District, et al. The First Amendment, as applied through the Fourteenth, did not permit a public school to punish a student for wearing a black armband as an anti-war protest, absent any evidence that the rule was necessary to avoid substantial interference with school discipline or the rights of others. Eighth Circuit reversed and remanded. 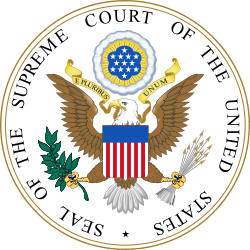 Tinker v. Des Moines Independent Community School District, 393 U.S. 503 (1969) was a decision by the United States Supreme Court that defined the constitutional rights of students in U.S. public schools. The Tinker test is still used by courts today to determine whether a school's disciplinary actions violate students' First Amendment rights. In 1965, Des Moines, Iowa residents John F. Tinker (15 years old), his siblings Mary Beth Tinker (13 years old), Hope Tinker (11 years old), and Paul Tinker (8 years old), along with their friend Christopher Eckhardt (16 years old) decided to wear black armbands to their schools (high school for John and Christopher, junior high for Mary Beth, elementary school for Hope and Paul) in protest of the Vietnam War and supporting the Christmas Truce called for by Senator Robert F. Kennedy. The principals of the Des Moines schools learned of the plan and met on December 14 to create a policy that stated that school children wearing an armband would be asked to remove it immediately. Violating students would be suspended and allowed to return to school after agreeing to comply with the policy. The participants decided to violate this policy. Mary Beth Tinker and Christopher Eckhardt were suspended from school for wearing the armbands on December 16 and John Tinker was suspended for doing the same on the following day. (The two youngest participants were not punished.) Mary Beth, Christopher, and John were suspended from school until after January 1, 1966, when their protest had been scheduled to end. A suit was not filed until after the Iowa Civil Liberties Union approached their family, and the ACLU agreed to help the family with the lawsuit. Their parents, in turn, filed suit in U.S. District Court, which upheld the decision of the Des Moines school board. A tie vote in the U.S. Court of Appeals for the 8th Circuit meant that the U.S. District Court's decision continued to stand, and forced the Tinkers and Eckhardts to appeal to the Supreme Court directly. The case was argued before the court on November 12, 1968. The case was funded by Des Moines residents Louise Noun, then the president of the Iowa Civil Liberties Union, and her brother, Joseph Rosenfield, a businessman. Previous decisions, such as West Virginia State Board of Education v. Barnette, had established that students did have some constitutional protections in public school. This case was the first time that the court set forth standards for safeguarding public school students' free speech rights. This case involved symbolic speech, which was first recognized in Stromberg v. California. The court's 7–2 decision held that the First Amendment applied to public schools, and that administrators would have to demonstrate constitutionally valid reasons for any specific regulation of speech in the classroom. The court observed, "It can hardly be argued that either students or teachers shed their constitutional rights to freedom of speech or expression at the schoolhouse gate." Justice Abe Fortas wrote the majority opinion, holding that the speech regulation at issue in Tinker was "based upon an urgent wish to avoid the controversy which might result from the expression, even by the silent symbol of armbands, of opposition to this Nation's part in the conflagration in Vietnam." The Court held that for school officials to justify censoring speech, they "must be able to show that [their] action was caused by something more than a mere desire to avoid the discomfort and unpleasantness that always accompany an unpopular viewpoint," allowing schools to forbid conduct that would "materially and substantially interfere with the requirements of appropriate discipline in the operation of the school." The Court found that the actions of the Tinkers in wearing armbands did not cause disruption and held that their activity represented constitutionally protected symbolic speech. Justices Hugo Black and John M. Harlan II dissented. Black, who had long believed that disruptive "symbolic speech" was not constitutionally protected, wrote, "While I have always believed that under the First and Fourteenth Amendments neither the State nor the Federal Government has any authority to regulate or censor the content of speech, I have never believed that any person has a right to give speeches or engage in demonstrations where he pleases and when he pleases." Black argued that the Tinkers' behavior was indeed disruptive and declared, "I repeat that if the time has come when pupils of state-supported schools, kindergartens, grammar schools, or high schools, can defy and flout orders of school officials to keep their minds on their own schoolwork, it is the beginning of a new revolutionary era of permissiveness in this country fostered by the judiciary." Harlan dissented on the grounds that he "[found] nothing in this record which impugns the good faith of respondents in promulgating the armband regulation." Tinker remains a viable and frequently-cited Court precedent, though subsequent Court decisions have determined limitations on the scope of student free speech rights. In Bethel School District v. Fraser, a 1986 case, the Supreme Court held that a high school student's sexual innuendo–laden speech during a student assembly was not constitutionally protected. Though Fraser applies the Tinker test of disruption to school decorum, if not undermining of educational mission, the effect is to make an exception to Tinker for "indecent" speech. Hazelwood v. Kuhlmeier, where the court ruled that schools have the right to regulate, for legitimate educational reasons, the content of non-forum, school-sponsored newspapers, also limits Tinker's application. The Court in Hazelwood clarified that both Fraser and Hazelwood were decided under the doctrine of Perry Education Association v. Perry Local Educators Association. Such a distinction keeps undisturbed the Material Disruption doctrine of Tinker, while deciding certain student free speech cases under the Nonpublic Forum doctrine of Perry. In Morse v. Frederick, the so-called "Bong Hits For Jesus" case of 2007, the Court held that schools may, consistent with the First Amendment, restrict student speech at a school-sponsored event, even those events occurring off school grounds, when that speech is reasonably viewed as promoting illegal drug use. In 2013, the full U.S. Court of Appeals for the Third Circuit re-heard a case that had been argued before a panel of its judges, considering whether a charitable effort—a breast cancer awareness drive—impermissibly disrupts a middle school by distributing bracelets imprinted "I ♥ Boobies." ↑ Noun, Louise Rosenfield (1990). Journey to Autonomy : A Memoir (1st ed.). Ames, IA: Iowa State University Press. ISBN 0-8138-1899-0. ↑ Janega, James (1 September 2002). "Louise Rosenfield Noun, 94: Iowa feminist, writer, civic activist". Chicago Tribune. Retrieved 2 May 2014. 1 2 Eastland, Terry (2000). Freedom of Expression in the Supreme Court The Defining Cases. United States of America: Rowman & Littlefield publishers. p. 185. .
↑ Tinker v. Des Moines Indep. Cmty. Sch. Dist., 393 U.S. 503, 506 (1969). ↑ Tinker, 393 U.S. at 509. ↑ Tinker, 393 U.S. at 517-18. ↑ Tinker, 393 U.S. at 526. ↑ "'I ♥ Boobies' Case Heard En Banc by Third Circuit". The Legal Intelligencer. February 21, 2013. Retrieved February 21, 2013. (subscription required (help)). ↑ Bomboy, Scott (March 10, 2014). "Update: How the 'Boobies' case almost made it to the Supreme Court". Constitution Daily. National Constitution Center. Retrieved February 15, 2016. Schema-root.org: Tinker v. Des Moines John Tinker's page about Tinker v. Des Moines. Contains a current news feed.